Some people have questioned whether the historic flowing artesian well fueled by an underground spring just south of Cedar Creek is really flowing. It’s hard to tell, when driving down Main Street, if water is actually coming out of the well, located behind the fire barn on Maple at Main St. The Post took a look, and it is indeed flowing—although there is less water than usual. According to Cedar Springs interim DPW Supervisor Al Kensil, the low flow from the well is because we’ve had such a dry summer. “The aquifer hasn’t had a chance to recharge yet,” he explained. “After the wintertime when the snow melts, it will bounce back.” He went on to say that the water level goes up and down each year. According to the United States National Geological Survey, the nearest water table measurement is in Rockford, near the Rogue River, and it is low. 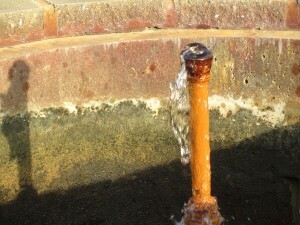 This flowing well has been here as long as anyone can remember. Many of the town’s elderly residents remember getting drinks or playing in it as a kid. It’s thought to be in the general area where the first dwelling in the village of Cedar Springs was established. According to the Cedar Springs Story, by Sue Harrison and Donna DeJonge, Ora Lewis related that when his grandfather, Dennis Lewis, lived in Grand Rapids, he heard of a place far north called Cedar Springs. Near the road by the creek was a tavern, and close by were some Cedar trees and a large spring, giving the town its name. It was probably owned by John and Lydia Smith, who settled here in 1851. He ran a sawmill and their home was a log cabin in the forest, and also served as a hotel. The article should reference “United States National Geological Survey” not “United States National Geographic Survey”. Thanks for the good catch!